Metro testing electric buses with 140-mile range. Between 80 and 91 low-cost housing units ($) coming to Lower Queen Anne. Rich Smith continues his quest for Light Rail signage that is comprehensible to humans. Apply for an opening on ST’s Citizen Oversight Panel. Trailhead Direct, now done for the year, served 10,000 round trips in 2018. Shaun Scott’s city council candidacy sounds promising on STB issues. WSDOT has a draft project list for the next three years, and is looking for public comment. Scooters and bikes complimentary in Portland? King County ponders Metro’s future business model. Bike lane implementation slipping on all fronts. Citywide street parking rates ($) recalibrated — RPZ permits make some of these problems unsolvable. Sally Bagshaw is done after this term. We will miss her. Closing the UW Laundry facility not good for its employees, but may lead to a denser use right next to Mt. Baker Station. Car hits pedestrian ($) under Angle Lake Station. TriMet going nuts on new parking. San Francisco may axe parking requirements altogether. This American transit atlas looks interesting. Trade war making projects more expensive ($). Before jumping on Mr. Scott’s bandwagon, I suggest readers go to one of the stories linked in that article. I assume Mr. Scott, as the author of that article, opposed those upzones. Note that these upzones don’t hand over the land to developers. It is already private, and in their hands. The upzones merely allow buildings with more floors. The article makes it painfully clear he is not a fan of the first-floor retail design. The “stack and pack” reference is also disturbing, since it seems to conflate one particularly callous landowner with all multi-story apartments. So, is Mr. Scott against upzones unless the land is in public hands? His mentor, Jon Grant, was not given this dignity. Various of Mosqueda’s surrogates accused Grant of jumping in the race against a woman of color (she jumped in the race against him), and race-baited him in other ways that were way off base. But the unseemly elements of that contest are now sewage under the bridge. Mosqueda has demonstrated she would be an awesome mayor someday. Let’s hope for a clean race, and that we will someday have ranked choice voting so there will be a free-market-ish deterrent to mudslinging. That article in City Arts was written about the struggle of the ACC Tenants Association against American Campus Communities, which has been blatently violating the rights of its tenants in an effort to convert the covenant mandated family housing of Bridges into dorm housing. As such, the “stack and pack” language was and continues to be appropriate. Within the article, Scott is not arguing against upzones, but he is forcefully arguing that upzones alone are nowhere near enough. Johnson is guilty on that count, as exemplified by his office pushing the tenants association to Kshama Sawant’s office instead. We need to defend tenants rights to the maximum degree, and we need to build housing for all, which the market cannot do. I sense you wishfully transferring your values onto those of Scott. I have seen no indication from him that he supports an all-options approach to the housing crisis. Those who have followed this blog long enough know we’re fans of public housing, non-profit housing, and for-profit housing, as long as they make good use of that land’s footprint. The “free market urbanist” epithet is silly. If he wants to be supportive of allowing more than just public housing, *he* needs to say that. The surrogates-walking-back-the-rhetoric is the sort of Trumpian politics he seems to disdain. Let him walk back his own rhetoric. My bad. The story behind this driver kinda old news. Here’s a video on him, if you haven’t seen it already. I tend to prefer my drivers on the reserved side. Sometimes they are a little too effusive, like limo driver Lloyd Christmas saying goodbye to Mary Swanson at the airport in Dumb and Dumber. I’m not offended if a bus driver doesn’t say hi or bye to me. But this guy is kinda cool. I hope he drives the 44 sometimes, because every single deadhead 44 trip is in service as a 43 to/from Capitol/First Hill. I have to think that the planners thought of him when they included those 43s. Thanks, Sam (and Preston). Good stuff. Seattle’s recent 90+ summers combined with hilly terrain. Albuequerque’s line is run on pretty flat terrain. sorry, comments meant for Chris below. Or am I missing something, and providing ST Express service hours is less flexible than providing Link service hours? Or is the effect of those hours on debt repayment and bonds less of a drop in the bucket than it seems? The ST3 decision was just for ST3; I don’t think it has any implications for ST4. The ST3 allotment was based on two things AFAICT: the estimated need after Lynnwood, FW, Everett, Tacoma, and Issaquah open; and budget constraints. The estimated need includes the ST2 openings because ST had not decided that yet (it was obviated by ST3, the way KDM’s opening date and feeders to it were obviated by ST3). In January 2016 the board received three ST Express planning scenarios for 2024: fewer, same, or more hours than currently. That was long after the ST2 vote, and ST3 was still uncertain. So ST had flexibility then to spend more or less I assume that will remain the case. The other issue is ST3’s strong budget pressure. ST initially wrote a 15-year plan, the same size as ST1 and 2, thinking that’s what taxpayers were used to and comfortable with. But all the subareas and public loudmouths said “More!” Snoho and Pierce wanted to get Everett and Tacoma into this round, Snoho wanted the Paine Field option, the Seattle government wanted West Seattle, and transit fans revolted when offered just a Ballard streetcar (especially to fund West Seattle Link). So ST wrote a 25-year plan including all those. But it was tight to fit everything all in and keep it to the “$54 billion” (actually $28 billion) that was already unprededentedly high and a potentially hard sell. So ST essentially played it safe with ST Express and chose the low option. And now there are concerns that federal grants might not come through (even though Lynnwood is succeeding, because Lynnwood had the highest merit and was applied for before the 2016 changes in federal policy). Those could hinder ST from expanding ST Express if it later decides to. But if those constraints don’t come to pass, I think it would take just an ST board vote to increase ST Express’ hours. They may feel differently in the 2020s after they see how trip patterns actually change in 2024, 2030, and 2036 and whether their predictions were correct. And there will be continuing clamors for more service in areas not near Link. And the people on the board may be different then. That’s 91 down, 9,909 to go. 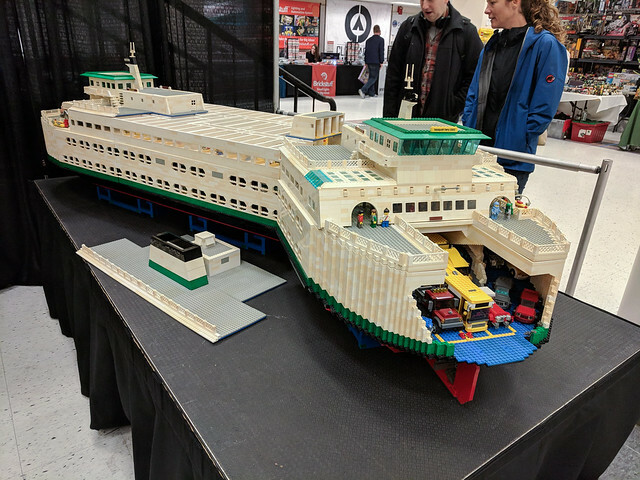 Is that an articulated ferry in the picture? Do such things exist? Urbanist article: ““transit pods” (whatever those may be)”. Yeah, what are they? Be wary of “testing electric buses”. Fortunately, it doesn’t hit 100* very often in Seattle. Does this mean that WSDOT is planning to fill in for the missing $20+ million in the next 3 years. I was wondering why Durkan was meeting with Gregoire at a UW volleyball match. I always took Gregoire to be more of a football fan. lmao of course they decided to give the job to engineers who made it all up as they went along instead of doing this in the first place. How does ST manage to consistently fail the most basic of tasks? It’s remarkable how the signage to/from the DSTT has improved but still appears to ignore best practices set by virtually every other city. The best wayfinding is visible transit infrastructure. Word to West Seattleites and Ballardites who are more concerned about their views than the functionality of the transportation system. I’m not going to vote to raise taxes to spend billions on hiding the light rail system. When there’s multiple bus bays/stops, ST really needs to put the route and direction information on their signs. When I’m transferring from Link to a bus at Westlake, I have no idea whether I want 3rd/Pine or 3rd/Pike or something else – I just want to know where to go for a specific bus. It’s galling to miss a bus just because I took the wrong exit and had to walk an extra block. With Link going from 16 to 37 stations by 2024/5, signage should be elevated to be a major topic generally. It took several years to make improvements to the original Link stations (Looking to see which direction went to the airport was previously a Where’s Waldo type hunt from 2010 to 2016). Hopefully, Mr Smith will have more reporters and stakeholders join his passion for doing signage right for upcoming opening days. It takes years for ST to even admit that anything is wrong and then it takes them more years to correct signs. With any luck, they’ll follow the London Underground example where each staircase and escalator combination goes to a radically different location and all the signs simply say “way out” so each time you use a “way out” you find yourself at a different location. I’ve often thought the art requirement and wayfinding should be coordinated. Rather than have one artist for the platform and a different one one at the entrances, it would seem to make more sense to have one artist per entrance — with that artists theme going all the way from the platform to the entrance. 2) Add numbers to the entrances as they do in Seoul, and make sure these make it to Google/Bing Maps interfaces. Seoul was so easy to navigate – “to catch bus X, use exit 15.” Most advertisements for local shops and restaurants also included the station and the closest exit number, which invariably worked. When zooming in on Kakao Maps (their version of Google et al, but better) in a station the exit numbers were clearly shown…and of course there was adequate station signage indicating where these exits were. Consistent letters without words only make sense to people who have already learned to navigate the system. Besides, changing out steelwork is expensive. Posting signs is cheap. Three topics in one written communication? No window supervisor would put me on duty on the Route 7, but it’s turning into that kind of morning. 1. Too bad about the laundry workers, but it’s great for density? Shame and counter-productivity, Martin. Anybody in any union local, or with any income that’ll let you live in Seattle- lifetime of “No” votes on every ST- the rest of their lives. Move the damn density a couple of blocks. 2. The Route 7- envy Nathan for his run-card. If Metro had followed through on plans to wire the 7 out of IDS and over the ramp to Dearborn to Rainier, might not have left. But would’ve been Hell’s everlasting fury watching Columbia City become a place where none of my young passengers of 25 years ago could ever afford to live. Over, what’s it been now, nine years…not a word of organized outrage from any quarter. Including present official effort to give poor people some overdue relief. Am I missing something…or Why Not? Thanks for bearing with me, late for appointment with State agency. Any help. much appreciated. If you move the density, it will be further from the station and less convenient for the residents. Unless you move the station too. But in reality, you can’t move density, not if both that lot and the other lot are zoned for higher than their current use. Because in a era of rising population, both will be built. So trying to “move density” means that only one will be built, which is actually a decrease in the anticipated density (the number of people who would live in the station area). Mike, really giving Martin a bad time about making “density” into a a holy goal that subordinates workers’ legitimate right to a living to a residential spacing arrangement. Martin did include a link showing the workers’ point of view. But really do wonder it in fact either their laundry or a comparable industrial area be incorporated into every transit-oriented development. Different body-parts of same creature, don’t you think? Back from appointment. Matter of fare policy that turns ORCA card owners into fare evaders (customary ($) Martin) very much on my mind. Having just located Washington State Law on “Contempt of Court” consequences astounding in any possible connection with a missed tap. Whole policy is a smear of horse-droppings across the ST colors on the side of every Kinki-Sharyo in the fleet, and if nobody else is going to do anything but shrug, personally have to at least try to lysol it off a major part of my life’s work. But getting strong feeling my attitude is so far over the top it counts of as Escape Speed. Either- as often happens with preoccupations of mine- Western State is already full. Or that nobody including the Sound Transit Board thinks it’s worth the trouble to fix. Honestly can’t believe that any advocacy group like Transit Riders’ Union, or anybody on either Sound Transit Board or any City Council has nobody willing, let alone demanding to eliminate this kind of undeserved damage to the systems best fare-payers…the ones who’ve already paid for a whole month before first boarding. Little late today, but for future open thread…before I post a word here, can somebody show me where I’m making my mistake? If we have to choose one or the other, I definitely choose density over the laundry for that parcel. Perhaps the station shouldn’t have been cited there, but it was. Ideally, however, we would build a building that could accommodate both the laundry and density above. I think this is much more doable than most people assume, and this type of building does exist in other parts of the world. We need both jobs and housing to be next to transit. The transit center is away from the station because of the laundry facility. I don’t know if ST/Metro would have built an intermodal station if that hadn’t been the case, but it was blocked because UW is an “essential state service” and has higher eminent domain authority than ST has, and at the time UW didn’t want to relocate the laundry. (“Why should we incur the expense of moving the laundry for your station?” Um. because UW students live in Rainier Valley?) So Link lived with the laundry for just nine years, and now UW wants to close it? Couldn’t it have done that nine years ago? I don’t see how moving the laundry facility means laying anyone off. Build the new one. Move the employees a few blocks. Then build the new housing tower once the new laundry facility opens. In the meantime, get the ridiculous height limit lifted. I gather UW is closing it, not just moving it. Otherwise it wouldn’t make sense that it’s laying people off. They’re dropping their unionized laundry staff and going with a nonunion outside contractor. I went for a walk to pickup lunch today and on my walk, I passed by the north end of the East Link tunnel near the Bellevue transit center. Seeing it under construction just reminded me of what a cluster the process was with East Link through Bellevue. Continuously pushing the line further and further east until we ended up with an outdoor station with one end only a block from I-405 even though there is a tunnel under several blocks of downtown. Then, even though 110th was closed for many months for the tunnel construction, there isn’t even a pedestrian walkway under 110th to the transit center. Thinking about what could have been is so frustrating. I also see little concern or planning about the replication of the Mt Baker TC street crossing problem at BTC. Everyone at BTC transferring to and from Link will have to cross 110th. That’s on top of having insufficient curb space to drop off and pick up Link riders. Add in the two 405 BRT lines routes with hundreds of millions in new interchanges elsewhere, but terrible pedestrian-separated connections to the Link station too and no money to make it better for transferring riders. Let’s not even talk about how buses will have to use city streets for several blocks to turn around. I’m hoping it won’t be too messy. I don’t have much hope though. If STB is around in 2024, it will probably earn several posts about fixing this. Throw some numbers up against the wall and see what sticks? Metro’s pulled all the route info but some back of the envelope calculations I come up with a load factor of ~5 and a subsidy per round trip just north of $40. Anybody got some real numbers they can pin to this “success”. I ran through my own back-of-the-envelope calculations. I had to make a bunch of assumptions, including the cost per service hour, length of deadhead between terminal and base, and length of layover. I also relied on memory to conjure up the number of trips per day, since, as you say, the schedule information has been deleted from the website. Looking at the design of the trailhead direct routes, I don’t think trying to compete with other metro routes on ridership/subsidy metrics was really the objective here, as it is easy to calculate with back-of-the-envelope figures that even if every bus were completely full, the passenger hours/platform hours and subsidy/boarding would still lie at the bottom end of all Metro routes, due to the lack of in-route ridership turnover and high amounts of deadheading. A trailhead-oriented service is also the type of service where ridership will very wildly from trip to trip, depending on the weather and the schedules of large groups, so this has to be expected too. Rather, I think the goal was to experiment with different destinations and service patterns to let people vote with their feet which one they like the best. Since it was billed as a one-year pilot from the beginning, and funded largely by outside organizations, the funding decision was likely decided on “we have $x allocated specifically for trailhead direct, how to make the most of it”, rather than treating trailhead direct like a standard metro route, and holding it to the metro route productivity standards, accordingly. That said, finding funding year after year after year is much harder than finding funding for one year as a one-off pilot project, as many of the organizations that paid for it might decide to spend their money promoting the outdoors some other way next year. For instance, instead of running buses, maybe they decide to have people standing at the trailhead, handing out free coffee. Time well time what ultimately happens. I wish Metro could have found a way to add more 554 service, so riders wouldn’t have to choose between waiting a Mt Baker for a half hour, waiting at ID Station for a half hour, or waiting at Capitol Hill Station for a half hour. Start them all from Issaquah TC, and run more frequent service on both ends (554 to the west and TD routes to the east). That’s how to make transit more attractive. If service can’t be added to the 554, start some TDs from ID Station, timed to alternate with the 554. And then have some short TD lines that don’t go west of Issaquah TC. Yes, I noticed that the number was for the whole season rather than per day as most transit stats are. A route like this can’t be evaluated just on pure ridership. There’s an advantage in having transit go to other transit modes (ferries, airports), stadiums, malls, tourist attractions, and recreational areas. even if they’re not the highest ridership. Hiking is important for health, especially for city-dwellers, and there should be a way to get to the largest concentration of trails without a car. Both for equity, and to counteract the incentive to get a car. In Europe or China, you just take transit to the trails. In most of the US. if you want to go anywhere outside the inner city you have to use a car, so you might as well buy a car anyway, And Uber/taxis are no substitute because they’re several times more expensive than transit, which adds up if you use it more than occasionally. So there are reasons for a trailhead route even if it has only five people. Part of its high subsidy is that East Link doesn’t exist yet, so it has to go to Mt Baker or Capitol Hill if it wants to be on the light rail line, which is the most efficient way to serve the most areas simultaneously. People could take the 554 or 550, but that adds up to more time, especially if they transfer to them downtown and it’s a 3- or 4-seat ride. And Mt Baker is pretty far away from I-90; it seemed to me to take a significant amount of time to get down there. Judkins Park would have been better, but Judkins Park doesn’t exist yet. I wondered why it didn’t just go downtown or to SODO instead of Mt Baker, but I think Metro wanted to keep it out of downtown to avoid the occasional weekend congestion, and to wean people from the “everything to downtown” mentality. It is pretty common for agencies to report ridership per year. I find it annoying, especially since the numbers can be huge (e. g. Houston METRORail carries 19 million people a year). But annual numbers are often easier to find than daily numbers. I would much rather have weekday average, Saturday average and Sunday average. But anyway, this doesn’t run on a weekday of course. Furthermore, my guess is averages would be very misleading. Part of the problem with a bus like this is that it runs rain or shine. When it is raining, I would imagine it carries hardly anyone. When it is nice out, it carries a lot. In this case, since there weren’t that many runs and not that many stops, I think you could have a graph of pickups for each run (showing time and date). Throw in some weather information (what kind of day it was) and it would probably give a better idea of how successful this was. Stop data would also be very important. Are there lots of people riding from Seattle, or is this mostly a parking shuttle? How does this compare with other suburban bus routes? It might make more sense, ultimately, not to run this from Seattle, but from Eastgate, Issaquah or North Bend, and just improve service to those areas. But it is hard to tell without more detailed data. “Not owning a car was a close second” in why people took Trailhead Direct, after environmentalism. That’s astonishing given that the number of people without cars is something like 10%. Did they all use Trailhead Direct? I think I saw elsewhere that practically nobody got on/off at the Issaquah P&R on the Alps route, which is the only parking facility. I transfered there because I couldn’t make the last eastbound one from Mt Baker, and I was the only one there. The other two routes have parking, and one has no transit access, so that must be where all the drivers were. Based on my anecdotal experience, trailhead direct was, by and large, NOT used as a parking shuttle; the vast majority of riders I observed got on in Seattle, and almost nobody got on outside of Seattle. Even North Bend P&R got more use from Seattle people getting off to visit North Bend than North Bend people parking to ride to the trailhead. Also worth noting – the Mt. Si route did serve a stop at 8th and Pine, which is just three blocks from Westlake Station. This means that Ballard to Mt. Si was actually a two seat ride, not a three seat ride, although the downtown connection wasn’t well advertised, and have been more accident than deliberate design. In general, I think the trailhead direct routes should just go downtown, where it’s just one more connection to almost anywhere in the city, rather than picking and choosing neighborhoods for premium service. Once East Link opens, the route should truncate at South Bellevue P&R. The other advantage of having the trailhead shuttles go downtown (in the short term) is that they can combine with the 554 to provide more frequent service to Eastgate and Issaquah, picking up non hikers in the reverse direction travel that is currently just deadheading. It wouldn’t take that many people riding between Eastgate Freeway Station and downtown to make a noticible bump in ridership. Issaquah TC, I don’t think the Mt. Si route should stop there because it’s too far out of the way for a thru route that stays on the freeway. Finally, I would consider replacing mailbox peak with rattlesnake lake, and have it connect with the Mt. Si route in North Bend, so that it’s more than just a parking shuttle. In the morning, I would offer a guaranteed timed connection, where the rattlesnake lake shuttle waits for the incoming bus from Seattle before departing. Metro is not the only agency funding Trailhead Direct. KC Parks, and a variety of Chambers of Commerce are also providing funding, both to alleviate parking crunches ($40 subsidy/rider is small compared to expanding a parking lot in a natural area), and also in the hopes of attracting hikers to local businesses. We have visited downtown Issaquah and lunch after hikes far more (i.e. more than 0) than we would have without Trailhead Direct. The Seattle Transportation Benefit District also funded the Seattle routes. Nice that everyone is kicking in. But King County Parks is constantly complaining about not having enough funding. I’ve got no problem with paying to park at Marymoor but when they close public restrooms because they ostensibly have inadequate funding how is it they have funds to send techies hiking? Unless Metro is 100% getting paid to contract this service they have no business spending any money on it. Unless of course they are flush with cash and there’s no actual transit needs that could be better met. I find a disconnect with the beg for money vs spending it on nice to have amenities. If all these donors (mostly it seems of public money) are altruistic in there motivation then why not fund trips for kids through inner city Boys & Girls clubs? More transit, more trees describes Sound Transit’s tree replacement program for the Lynnwood Link Extension including an overview of our work with project partners and jurisdictions along the corridor, proposed planting plan and why some trees will be removed to make room for the future tracks and construction. I guess ST’s scrubbers missed this one. But, hey, at least we get yet another colorful, glossy folio to look at. And the there’s this from the Link Progress Report for Q3 2018…. FWIW. I know that ST has a 9-month float on this project but nevertheless that still doesn’t account for the inconsistencies noted above. Frankly I wouldn’t be surprised if this project’s revenue service date gets pushed out to 2025. Hence, my head scratching to a planned revenue service date in July. Bike lanes north of the LR station on 124th are a waste.Why would anybody use them? South to Bel-Red makes sense as from there you can continue on past the Welcome to Wilburton sign and drop into DT the only safe way. And, someday, it will tie into the promised Bellevue east/west “connector” and the BNSF bike path to Renton. On 130th, where the P&R is going to be the opposite is true. Going north ties in with the 520 trail and is one of the better N/S corridors via 134th/132nd. Put the money saved into bike infrastructure on 116th. It’s the Medical Mile, connects to S Kirk P&R, the improved Northup infrastructure (the “missing link” of the 520 bike trail) and 116th involves a lot less climbing than 134th/132nd and is a direct shot to Totem Lake; the x-Kirkland corridor being the scenic route. The default should be, if you have an arterial street, it needs a bike lane. Riding a bike shouldn’t require careful route planning to work around only 1 out of 3 streets having bike lanes. In this case, 124th connects to Northup, which connects to 130th, which connects to the 520. From a point along 124th just north of the station, taking this route vs. Spring Blvd. to 130th avoids two left turns and two track crossings. That should be justification enough. It’s not like there’s a compelling reason out there why 124th *shouldn’t* have bike lanes. Ah, yes there is. You need to actually try to ride this. 1st, the hill approaching Northup NB on 124th is hideous..You get there and what, you’re going to compete with Semis and buses to get on the 520 on ramp? Left turn… to what that wouldn’t have been better taking 120th? Rt turn… again should have taken 130th and back tracked. Truth is, there’s not much either direction that anyone would be accessing via bike. If you’re smart, riding a bike you’ll take the route or least resistance. Not providing stupid routes makes it better for people that don’t know the local terrain. This is perhaps the poster child for how Bellevue creates GREAT bike paths that are SHORT and connect to absolutely nothing. Long after I’m dead I’m sure these will ultimately be a wonderful network. But being self centered I’m more interested in how things might work in my lifetime (+/- 20 years). Even long after I’m dead and gone I can’t imagine why a bicyclist would use 124th NB. Again, the question is where are you going that there isn’t a better route. Just providing a BAD route is expensive and a disservice. And what looks good on a 2D map is irrelevant when you have to provide the motive power to go uphill and battle with traffic. The idea that “by default:” we provide a bike path to nowhere makes no sense. I mean really, 124th ends as a freeway onramp! I’m also trying to figure out what Bellevue’s long-term plan is for how you’re supposed to get from downtown Bellveue to the ERC trail. 12th St. already has a nice path over I-405, and the city has plan underway to connect it to the 108th Ave. protected bike lane that goes through the heart of downtown. The problem is, once you get to 116th, the bike lane just ends, leaving nothing except two car lanes each direction, plus a very narrow sidewalk that is not currently designed for bikes, at all. There is a left turn available onto Spring Blvd., which hopefully has bike lanes and less traffic than Bel-Red road, but it’s not clear how people are supposed to get there. Cut into the left lane of a very busy street and make a vehicular left turn? Then, when you’re finally on Spring Blvd., it passes over the ERC on a bridge, and I haven’t heard about anything in the way of ramps to actually get down there. Another potential option could be to use 10th St. and access the ERC one block further south, but that would require the installation of a small ramp, plus a popular bike route that cuts through a parking lot, having to watch for cars backing out of spaces (e.g. like Westlake used to be several years ago). I hope the city is thinking about this. It would a tragedy to have such a great north-south bike route half a mile from downtown, with a grap of just a few hundred feet preventing safe passage from the trail to the actual downtown. Doubly a tragedy, given that the hard, expensive work of building the bike paths across I-405, on the 10th and 12th St. bridges, has already been done. Yeah, you and everybody else that actually might ride a bike. Bellevue’s “plan” long term has been the exact same for sidewalks as it has been for bikes. Which is to say they build short disconnected sections nobody uses or cares about with the idea that eventually the entire “network” will be complete. In short, there is no concept of “routes”. And given the terrain and the other inherent obstacles that exist makes no sense. But, to date nobody on the council or the transportation commission actually rides a bike over the distances that matter. Bottom line, it’s not considered a “real” mode of transportation. Perhaps that’s fair giving the tiny percentage bike users represented. But not if you look at the cost being spent. We really should be getting more “bang for the buck”! And when a ton of money gets spent on bike lanes that nobody uses then it’s even harder to go begging for $$$. Instead of guessing, I went ahead and looked at Bellevue’s planning documents. The plan is to have a high-quality bike connection between downtown and the ERC, but not until Spring Blvd. opens, which hasn’t happened yet. So, judging it now would be like bashing WSDOT in 2015 for building a new premium bike trail through Medina that nobody was riding, because it ended at the bridge and didn’t go through into Seattle. The I-405 crossing piece had to happen when it did because that was when the roadway was being rebuilt, anyway, to accommodate an I-405 widening project. To not add the bike path then, then try to retroactively add it later would have costed orders of magnitude more money. It’s also worth nothing that Bellevue did, in fact, already add bike lanes on 116th, between 12th and 520, and also Northup Way, connecting the east and west sections of the 520 trail together. Of course, there is still a lot of work to done. 8th St. and Bel-Red road are two major east/west routes, which have no good alternatives without traveling significantly out of the way. Neither are likely to get any bike facilities in the foreseeable future. The problem is – we’re still at the point where bike facilities are left begging for the scraps of road space and money the city hasn’t found a way to spend on cars, and any bike facility that impacts peoples’ car commutes is a non-starter. But, on many roads, there is simply no space to make room for bikes without taking away car space. One other note about biking – as electric bikes get more and more common, the argument that “nobody will bike on street X because it’s too much work to go uphill” holds less and less weight. Give it another 10-20 years, pretty much anybody who cycles for transportation – at least in hilly areas like Seattle – is going to be doing it on an e-bike, and the pedal-only bikes will be relegated to fitness events that require it (e.g. races). Even STP, I can envision half the people doing it on e-bikes, once the battery ranges improve, and the cost goes down. The upright posture you get on a e-bike is so much more comfortable than the typical hunched-over bike position that provides optimal energy efficiency. The “bike lanes” on 116th have been there for ages. It’s better than nothing and at least there’s no major cross streets to worry about. On Northup they’ve added some green paint and a bridge across the BNSF ROW. Improved shoulders, sidewalks and lighting on Northup west of 116th are nice for the power commuter but once you get to Northup and 108th there’s no way anyone can spin that as part of the 520 bike trail. The other things that aren’t address is the nasty jog in 116th at Northup where bikes have to play Frogger in traffic to get in the left turn lane on Northup and I don’t see anything that looks like a planned tie in to the BNSF ROW. Of course that whole section of the planned bike path from Renton to Woodinville got hosed by ST putting in their maintenance facility. Bel-Red becomes NE 12th at 124th. The NE 12th 405 crossing is nice and ties into the Spring Blvd project which will in about 5 years provide a good east/west connection; at least as far as 140th. But if you’re trying to get anywhere south of NE 8th in Bellevue I still think using 124th will be superior to using NE 12th and battling through DT Bellevue. Letting planners say, “meh.. everybody will be on e-bikes” pretty much is a cop out for any non-motorized transportation infrastructure. Plus, at some point e-bikes are going to have to be registered and taxed as motorized vehicles, which they are. I wouldn’t be surprised (or sad) if they are banned from ped/bike paths like Burke Gilman, Sammamish Slew, Cross Kirkland, etc. I notice that all the “add bike lane” are accompanied with “widen street”. No thought about just rechanneling the streets. Widening the street is probably the primary goal, so putting “add bike lanes” first sounds like greenwashing. I’ve already seen how they’re widening 120th and 124th from two lanes to five lanes (with a center left-turn lane), making them larger than streets in higher-density areas in Seattle. This is more of the “everybody will drive” mentality, and “we want to supersize the roads”. NE 8th Street has already been widened the same way, making intersections where both streets are large. Actually, not. They were added just two years ago as part of a re-channelization project that replaced a 4-lane configuration (1 SB lane, 2 NB lanes, 1 center turn lane) with a 3-lane configuration (1 SB lane, 1 NB lane, 1 center turn lane, plus bike lanes in both directions). So, somewhat surprisingly, the precedent for re-channelization in Bellevue actually exists, at least when car traffic volumes are sufficiently light. The reason why they didn’t do it for 124th is likely projections of higher car traffic, once the Spring District opens. 108th is where the 520 bike begins as an off-street path, completely separated from cars. The wide sidewalk on the south side of Northup is part of the trail. After 108th, there is no space sharing with cars all the way to Seattle, except for the crossing of Evergreen Point Rd. and a couple of minor driveways. Even the intersections of 92nd and 84th, the bike path has a grade-separated tunnel. Actually, if you look at the painted bike lanes, you only have to merge with cars turning right on Northup. You don’t need to get in the left lane to turn left. That is an annoying omission, but, coming from the south, you can deal with it by avoiding 116th altogether and just taking 12th to 120th, then heading north on 120th to where the ERC picks up. For the time being, this requires riding in a car lane for about 0.3 miles, but at least there’s two lanes, so drivers can pass you without doing anything dangerous. At 120th, you can avoid having to play frogger to get into the left lane by making a half-turn to the right into the crosswalk, positioning your tires so that you’re facing north on 120th, in front of the car waiting for the light. When light changes, you’re home free. This is a classic cycling trick to make left turns at busy intersections without needing to merge into the left turn lane. It is quite useful. My understanding is that, once all the construction is finished, there will be room to route the bike path alongside the ST maintenance facility. It’s not going to split the trail into two. This depends on whether on view cycling as real transportation or just a toy. If cycling means driving to a flat trail and doing laps around with the bike, without actually going anywhere, than e-bikes appear to be zero sense. But, for those of us with commutes in the 5-10 mile range, with lots of hills, who want to arrive work without being drenched in sweat, and want to have enough energy to keep making that trip day after day after day – e-bikes are extremely useful. In the Seattle area, at least, completely banning such bikes from sidewalks and trails would make them all but useless for everyday commuting. If trails and sidewalks are off limits, how is one supposed to get across the ship canal? Or Lake Washington for that matter? Right now, we’re still in a state where most people own pedal bikes, but not e-bikes. But, over the years, as the cost of e-bikes comes down, that could change. Eventually, we could enter a world in which almost all new bikes sold are e-bikes, with the pedal bikes relegated to the hard-core racing cyclists. Already, we have thousands of shared e-bikes on the Seattle – and Bellevue – streets, giving people who don’t own an e-bike a chance to try the e-bike experience. It was my experience with the Lime e-bikes that eventually led me to buy my own e-bike. I’m sure I’m not the only one. In any case, e-bikes are already regulated by Washington State law, and the law is very clear that any bike speed-governed at 20 mph or less is considered a bicycle, and anything that allows motor assistance above 20 mph is considered a motorcycle. That definition is fine, since it’s really excessive speed on trails that is the problem, not the mere presence of a motor, especially a motor that won’t accelerate you faster than a normal bicycle speed anyway. In fact, the most dangerous riders I see on the Burke-Gilman trail are not people on e-bikes at all, but spandex-clad Lance Armstrong wannabees on pedal bikes, who think their commute to work is some kind of time trial. To say it’s ok for them to zoom down the Burke-Gilman at 25 mph, but not ok for me to cruise on it on my e-bike at 15 mph is both ridiculous and, for all intents and purposes, unenforceable. Dexter Avenue has a larger concentration of people than that part of the Spring District probably will, and it has two lanes and bike lanes.